Pesave app referral code, pesave referral offer- Pesave is a smart bank account which helps manage your money and grow your savings. It’s offering an amazing refer and earn offer in which you can earn 25 Rs on Signup and 25 Rs Per Refer. You need to signup using a valid Pesave referral code to get 25 Rs bonus. You can transfer this balance to bank account also. So why are you waiting for? Just use this Pesave refer and earn offer. Enter all required details and order your free Platinum Debit Card. After you receive a debit card at your home, Go to Menu >> Your card >> Activate Card. This Debit card is absolutely free to use, no charges. Now Invite friends and earn 25 Rs for every friend who signup and activate the card. 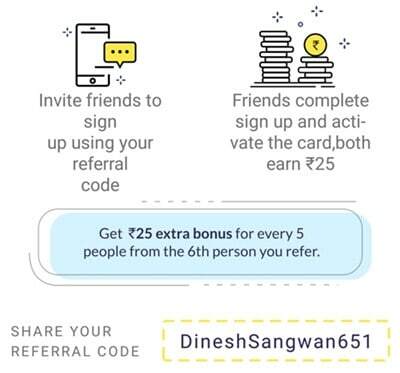 Earn extra 25 Rs for every 6th friend you Invite. No minimum redemption amount required to redeem this offer. After successfully signing up on pesave, Go to Menu >> Refer a friend. Here you will see your Pesave referral code.and share your pesave referral code with your friends. Enjoy pesave refer and earn offer! Earlier they were offering 75 Rs per refer which is now reduced to 25 Rs. Tags- Pesave app refer code, Pesave refer code, pesave referal code. Unable to register. From day before yesterday it is coming that the server is under maintenance. I can’t sign up. Anyone help me. Bro does not receive signup bonus? What should I do? Bro please add me on whatsapp group i am mahesh sihag maine hi first refer reward tere ko diya tha plzz add me. Bhai Footer me Whatsapp ka icon h, uspe click krke group me add ho jao. Ho jayege bhai, mere me bhi issue aaya tha starting me but fir hogye the. After filled first page with your referral code not going to next page after clicking on proceed. Hi, It’s may be server issue. Please try again after some time.